Do you have a lot of work to manage? If you hail from a business community, maintain a strict schedule, organize frequent conference calls or simply geeky enough to digitize your work then you might want to scan through the recent application offering from the South Korean multinational conglomerate company Samsung. 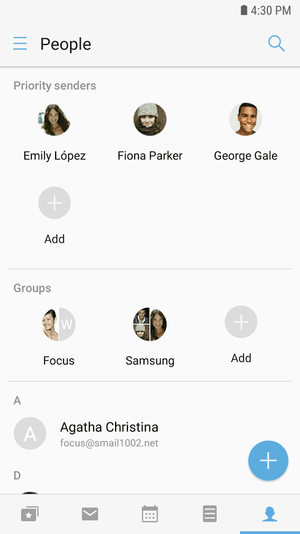 Recently, they have launched a utility managing android application named Focus that unifies email, calendar, task, memo, and contacts inside a singleton. The application supports multi-account facility and as per information listed on Google Play, the application can sync with various servers such as Exchange 2003 SP2/SP3 and above, IMAP and POP3, Hotmail, Outlook.com, and others, you name it. However stretching the usability, you must own a Samsung device running on Android 6.0.1 Marshmallow if you want to enjoy this cool addition to the store. Keeping an eye on some other in-kind arrivals such as Evernote, this one seems to add conference call management feature with emails handling, taking personalized notes from the user. The explanatory video reveals that a feature called “Keyword Setup” searches all your emails to give you a specific notification when they hit your account. Further, with one single tap a conference call is managed with ease. Another useful feature of this application is that it is responsive and was designed for the desktop and mobile version, promising a seamless experience. The application documentation also clarifies that it does not connect with a cloud service, instead, makes a connection directly with the email servers. For now, this application is open to feature requests and is also available for an installation.